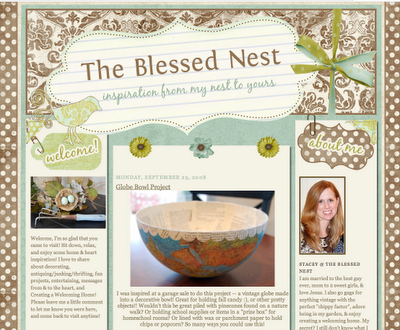 The Blessed Nest: Quick Chair Changeout & A Big Thank You! We have a Nantucket B&B feel to our bedroom, and I really wanted a chaise for this area. But the budget wouldn't allow for any new furniture (nor window treatments for our 5 windows in here! ), so I got creative by using what I already had!! I used a FREE wing chair paired with a FREE ottoman! The wing chair we got from Hubby's old company when they were going to throw it out for a newer model, and they offered it to us first!! Yee-haw! :) And the ottoman came free from my sister with the matching free chair and couch that are now slipcovered in my sunroom here. Nope!....They work together because they are both white. But the ottoman slipcover matches the sunroom slipcover set (so I can use them all together in another house/another room someday). And the wing chair slipcover is actually our old matelesse bedspread! I just draped, tucked, and safety pinned it on! Behind Door #3........the ugly old blue of the chair! See how I just safety pinned the back together? No one goes into that little corner, so there was no need to be perfect about it! :) So what if it doesn't even cover the whole back?!! Add a pillow I had from HomeGoods, and a cute antique cabinet filled with treasures, starfish, and a picture of us on our honeymoon from years ago, and there you have it! I also heard that you like my posts in general, especially the decorating and project posts. You also like low cost ideas and Creating a Welcoming Home! I am planning to keep my post topics about the same as now, but I am going to try to keep them less wordy (after today -- LOL!!!) than before, and use more pictures! Now, don't you worry....The Blessed Nest isn't going "big time" (I am a small town girl after all!) and going to make crazy changes leaving you wondering what happened!! :) I just have been thinking about some small things that could improve the "visits" I get to have with y'all!!! I love it...you're adding to my idea bank for our room...hmmmm...Here's a question or idea for a blog...where do you find these cute antique little shelves, like the one behind your chair here? Did you make it blue...was it that way?? Are these boocoo bucks items? Love how you use what you have! Very pretty! I had forgotten about your sunroom. It's such a pretty room! I also love the blue cabinet behind the chair. Can you tell us more about it? Your chair is great too. Looks nice. I love sitting areas. I love what you did in your little nook! Your blog is wonderful. Whether you change things or not, you won't be able to get rid of me! I love visiting you. The chair looks wonderful! Such a great corner for relaxing and reading. Perfect solution! Looks so cozy! Very pretty! I love white furniture - it just always looks so fresh. I like that you re-used a piece you had (free is always good)! Love your chair...I have always wanted a matelasse slipcover!